HBase is a popular column-oriented, NoSQL database management system that runs on top of Hadoop Distributed File System (HDFS). It is well suited for sparse data sets, which are common in many big data use cases. So you have finally found your dream job in HBase but are wondering how to crack the Hbase interview and what could be the probable 2019 Hbase Interview Questions. Every interview is different and the scope of a job is different too. Keeping this in mind we have designed the most common Hbase interview Questions and Answers to help you get success in your interview. 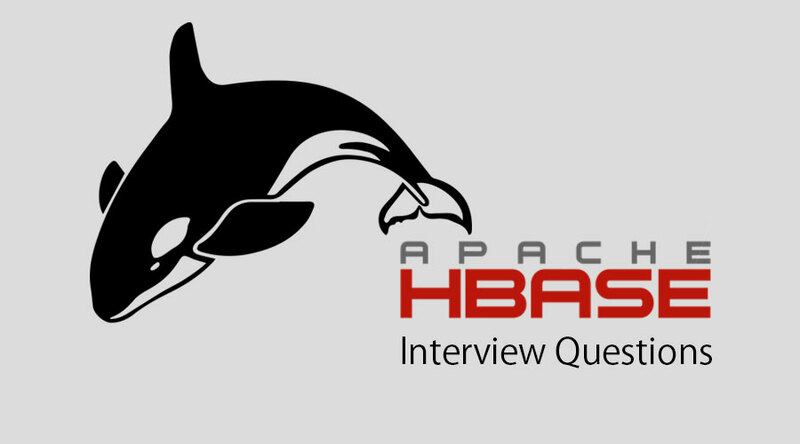 This first part covers basic HBase Interview Questions And Answers. 1. When should you use HBase? i.Data volume: Should have petabytes of data to be processed in a distributed environment. ii.Application: HBase is not suitable for OLTP(Online Transaction Processing) systems which require complex multi-statement transactions.It also lacks complex SQL support which is required for relational analytics.It is preferred when you have a huge amount of data with a slightly different schema. iii.Cluster Hardware: HBase runs on top of HDFS. And HDFS works efficiently with a large number of nodes (minimum 5).So HBase can be a good selection only with good hardware support. iv.Not Traditional RDBMS: Hbase cannot support any use case which requires traditional features like Join multiple tables, Complex SQls with nested or window functions etc. v.Quick random access to data: If you need a random and real-time access to your data, then HBase is a suitable candidate. It is also a perfect fit for storing large tables with multi-structured data. 2. What is the difference between Cassandra and HBase? Both HBase and Cassandra have distributed NoSQL database for Big Data from the Hadoop ecosystem. Both built for different use cases. The HBase has kind of master-slave architecture with several components like Zookeeper, Namenode, HBase Master(Hmaster), and Data Nodes etc. Cassandra treats all nodes as masters which means all nodes are equal and perform all functions. HBase is optimized for reads, write is only happening to the master node and has strong consistency for reading after write. Cassandra has excellent single-row read performance if eventual consistency is selected. Hbase does not natively support secondary indexes, Cassandra supports secondary indexes on column families where the column name is known. Initially, Hbase is created in Google and they named it BigTable. Even now APIs of Bigtable and HBase is compatible. Origin of Cassandra is from a paper for DynamoDB which is NoSQL database from AWS. Let us move to the next HBase Interview Questions. 3. What are the major components of Hbase? HBase a has three important components- HMaster, Region Server, and ZooKeeper. iii.ZooKeeper – ZooKeeper is a cluster coordination framework widely used in Hadoop ecosystem.Zookeeper tracks all servers (Master and region servers) present in cluster HMaster contacts ZooKeeper and notifications are produced in case of errors. 4. What is HBase Bloom Filter? This is the common HBase Interview Questions asked in an interview. An HBase Bloom Filter is an efficient mechanism to test whether a store file (When something is written to HBase, it is first written to an in-memory store, once this memstore reaches a certain size, it is flushed to disk into a store file) contains a specific row or row-col cell. Normally, the only way to decide if a row key is present in a store file is to check in file’s block index, which has the start row-key of each block in the store file. Bloom filters act as an in-memory data structure which helps to reduce disk reads to only the files likely to contain that row – Not all store files. So it acts like an in-memory index to indicate a probability of finding a row in a particular store file. 5. What is Compaction? Explain different types of it. HBase stores all the received operations into its memstore memory area. When the memory buffer is full, it is flushed to disk. Because this can create many small files in HDFS, from time to time, HBase can select files to be compacted together into a bigger one. A compaction is called Minor when HBase elects only some of the HFiles to be compacted but not all. In a Major compaction, all the files are elected to be compacted together. A major compaction works like a minor one except that the delete markers can be removed after they are applied to all the related cells and all extra versions of the same cell will also be dropped. Let us now have a look at the advanced HBase Interview Questions. 7. What is a difference between getting and Scan? Get will return an only single row from Hbase table based on row key given. Scan command returns set of rows depending upon given search condition. Usually get is faster than scan. So should prefer to use that if possible. 8. What happens when deleting a row? Column, Version, and Family Delete Markers are three different types of markers which mark deletion of a Column, Version of Column and Column Family respectively. 9. Explain the difference between HBase and Hive. This is the advanced HBase Interview Question asked in an interview. HBase and Hive both are completely different Hadoop based technologies for data processing. Hive is a relational-like SQL compatible distributed storage framework while HBase is a NoSQL key-value store. Hive acts as an abstraction layer on top of Hadoop with SQL support.HBase data access pattern is very limited with two primary operations-get and scan. HBase is ideal for real-time data processing where Hive is an ideal choice for batch data processing. 10. What are Hlog and HFile? HLog is the write-ahead log file, also known as WAL and HFile is the real data storage file. Data is first written to the write-ahead log file and also written in MemStore.Once MemStore is full, the contents of the MemStore are flushed to the disk into HFiles.